For most users, and most uses, the Sony ICD-UX560 voice recorder is pretty tough to beat. It delivers top-notch recordings, is loaded with features, and won't break the bank. If you want something cheaper, or more basic, we found a great under-$50 Sony recorder, too. 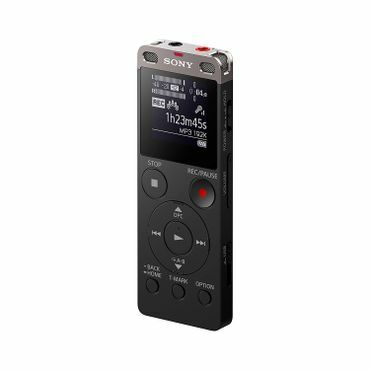 The Sony ICD-UX560 outclasses even pricier recorders in reviews. Its stereo recordings sound better than rivals' in nearly every situation -- bustling cafes, echoing lecture halls, hushed boardrooms. Thoughtful features make it an owner favorite: It's slim and light, with easy-to-use buttons, and its slide-out USB connector makes it easy to recharge and transfer files to your PC or Mac. For less than $50, the Sony ICD-PX370 includes all of the basics: one-touch record, headphone jack, plenty of memory and decent recording quality. You can adjust playback speed and microphone sensitivity, and bookmark and skip around within your recordings. Importantly, a USB hookup lets you easily offload recordings onto your computer -- a necessity that's missing from other cheap recorders. Capturing that crucial moment --whether it's an important interview quote, a college lecture you're going to be quizzed on later, or personal thoughts you want to capture before they fade from your mind -- is hard to do without a reliable digital voice recorder. At the high end of the market, you can find professional-grade models that are suitable for broadcasters or podcasters, for musicians looking to capture their performances, and for similar users and uses. However, these can run into the hundreds of dollars and are overkill for most. As such they are beyond the scope of this report. But, for $70 or less, you can get a great digital voice recorder that will nicely fill the bill for business and personal use. For between $50 and $80 or so, you can get a digital voice recorder that's equipped with powerful mics that capture great sound quality and offer a useful range of extra features. These are suitable for dictation, capturing interviews and lectures, and recording meetings. In the $30 to $50 range you can find pared-down but very usable digital voice recorders that meet most of the basic needs of average users who simply want to get something recorded. Voice recorders in this price range tend to have minimal to no extra features, limited file format support and lower recording quality than more expensive models (most only have a single mic). They make up for this by being relatively easy to use and notably less costly. For those with basic needs -- taking personal notes on the fly, for example -- they can nicely fill the bill. It's true that many smartphones can conveniently fill the role of a bare-bones digital voice recorder, but that doesn't mean dedicated recorders at this price range are obsolete. As Wirecutter notes, "The comparatively poor sound quality of their recordings may grate on you if you need to listen for extended periods of time -- say, for transcribing." Even low-end dedicated voice recorders will typically outperform cellphones (and their meager microphones), and offer much more flexibility. To produce our recommendations for top choices among digital voice recorders for different budgets and uses, our editors pore over hundreds of user reviews, while also factoring in any observations from professional reviewers. We look to those to learn how digital voice recorders perform, of course, but also how easy they are to master, their lineup of useful features, if there are any durability or user support concerns, and how much bang for the buck they deliver. If you're in the market for a high-quality digital voice recorder but don't need all of the high-tech extras that tend to hike up the price of some devices, there are some great options that can deliver top-notch recording quality without completely emptying your wallet. In this category, the Sony ICD-UX560 (Est. $80) emerges as the clear top choice. Reviews tell us that the ICD-UX560 (sometimes also sold as the Sony ICD-UX560BLK) is a great voice recorder for tackling everything from crowded lecture halls to quiet one-on-one interviews. The Sony ICD-UX560 triumphs in Wirecutter's seven-recorder test. "It recorded the most intelligible audio of all the recorders we tested and offers the most useful collection of features: It's rechargeable via USB; it has a legible, backlit screen; and its menu system is the easiest to navigate," testers say. "The UX560 is also the slimmest recorder we tested -- at 0.43 inch thick it can easily fit in a shirt or pants pocket." The ICD-UX560 placed either first or second in every single scenario -- big lecture hall, loud coffee shop and dictation in a quiet room. It's easy to use, reviews say, with all of the handy features most users will want. Physical buttons on the front let you power the ICD-UX560 on, record/pause, stop, play and fine-tune settings. The menu gives you more choices -- recording format, audio quality, scene selection and more -- and the backlit screen proves easy to see. Its built-in 4 GB of flash memory holds 39 hours of MP3 recordings, and you can add a microSD card for more storage. A slide-out USB connector makes it easy to transfer files to your PC or Mac, as well as recharge the built-in lithium-ion battery. A 3-minute "quick charge" gives you 1 hour of recording time. Fully charged, the battery soldiers on for 27 hours. 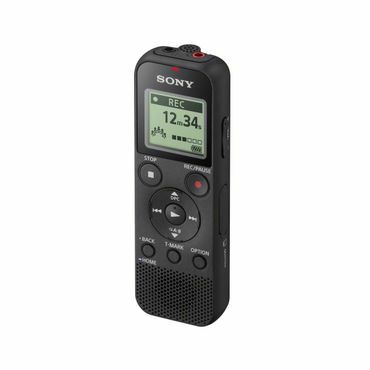 Slimmer and lighter than cheaper digital voice recorders, the Sony ICD-UX533 measures 4 by 1.4 by 0.4 inches and weighs 1.8 ounces. It includes 1/8-inch mini microphone and mini headphone jacks, in addition to its built-in speaker and stereo mic. Other digital voice recorders in this price neighborhood lag behind the Sony according to feedback, but the Olympus WS-853 (Est. $65) might be worth considering. It's Wirecutter's runner-up pick in testing. It has some pluses -- the Olympus includes double the built-in storage (8 GB) and quadruple the battery life (110 hours), though it requires two AAA batteries -- and two rechargeable NiMH batteries are included. On the down side, audio quality is worse than the Sony's, its menu is harder to navigate and the screen isn't backlit, so forget about fiddling with menus in the dark. User feedback, while a notch below the UX560 is still pretty strong (4.4 stars at both Amazon and Best Buy, for example), but we did see several complaints that the built-in speaker's volume is so weak that it's actually inaudible. Money might not be an object to some, but plenty of folks would like to spend a little less for a digital voice recorder, or they could care less about some of the features found in pricier units (let alone the learning curve needed to master those). If that describes you, the Sony ICD-PX370 (Est. $40) is a basic but solid voice recorder for note-taking and capturing class lectures. For less than $50, this Sony digital voice recorder includes all of the necessities: Headphone jack, 4 GB flash memory (and a micro SD slot for adding additional storage), one-touch record, battery level indicator and a slide-out USB connector. It runs on two AAA batteries (included), and it's the usual shirt-pocketable size (about 4.5 by 1.5 by 0.8 inches and 2.6 ounces). It's not totally bare bones, either. Four "scene" settings let you choose Music, Meeting, Interview or Dictation, and the recorder optimizes itself automatically. You can also manually adjust the noise cancellation and playback speed, and bookmark specific spots in your recording. There are some downsides, however. It's mono-only, and the screen isn't backlit. Recording and playback are MP3-only. However, those concerns don't matter to most owners. Among cheap digital voice recorders, the Sony ICD-PX370 earns the most consistently high marks from users: 4.3 out of 5 stars at Amazon with about 50 reviews posted, and 4.6 stars at Best Buy with about 140 reviews posted. Satisfied users say it gets the job done at a reasonable price, recording class lectures, interviews, etc. quite adequately. Olympus's budget entry, the Olympus WS-852 (Est. $50), is nearly identical to the Sony ICD-PX370 as far as specs go. However, the Sony gets better owner reviews (we saw several complaints about the Olympus's sound quality, speaker volume and terrible instructions) and sells for a bit less, too. Can you go cheaper? Sure – but be careful. For example, Sony's cheapest voice recorder, the Sony ICD-BX140 (Est. $25), omits one very important detail. It has no USB port. That means there's no reasonable way to save your recordings onto your computer. And that prompts a big "You're kidding!" from Amazon shoppers, with many voicing frustration and disappointment over that omission. To make sure your digital voice recorder suits your needs and your budget, you have to put some serious thought into what you plan to use it for. Expert reviews can be a big help, but finding those for many current digital voice recorders is a challenge -- in fact, Wirecutter's seven-recorder shootout is the only up-to-date professional test we found. That means the best guidance often comes from the opinions of experienced users, which can be found in abundance at sites such as Amazon, Best Buy and B&H Photo. Using that feedback, we name the best picks as well as some alternatives worth considering.